I am currently uninjured but swim once a week as cross-training / my pitiful plea to my knees to not hate me. I am familiar with the merry hell of ITBS. 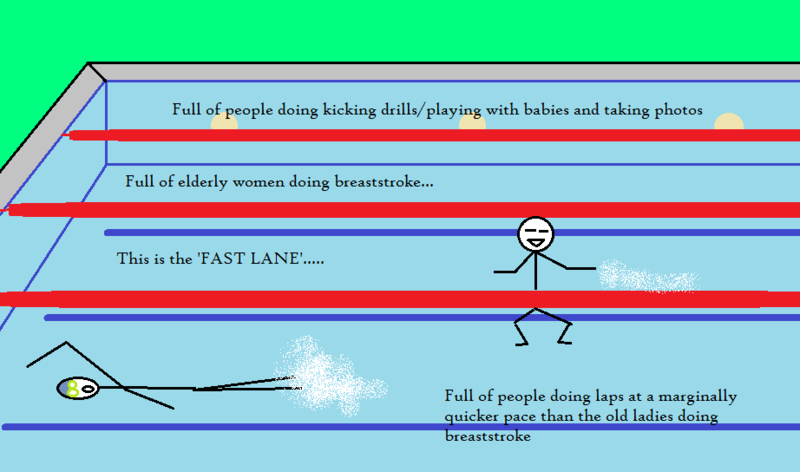 I do breast stroke at a marginally quicker rate than the old ladies, and in my pool that means that I belong in either the slow lane (at 6.30am) or the medium lane (at pretty much any other time). Here’s what I don’t get. My pool has three lanes — slow, medium, fast. 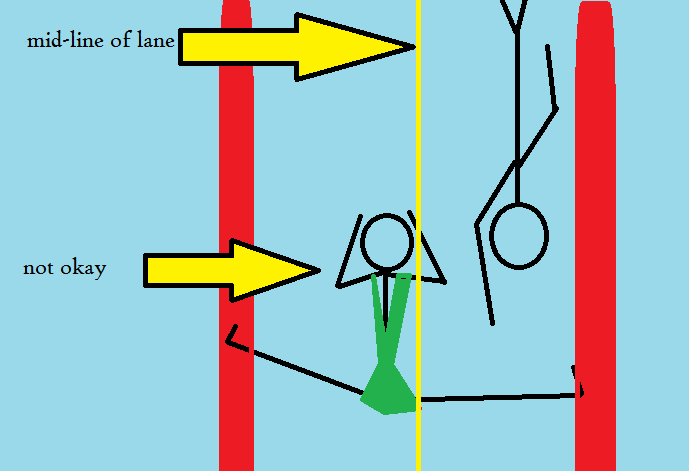 The lanes take up half the width of the pool. If you want to chat, float, do kicking exercises, play with flotation devices, generally do anything that isn’t swimming laps, there is a whooooooole other half of a pool right there. (Why you’d come to the pool for a chat at 6.30am in November in Glasgow is a different question, but I’ve seen ’em.) Given all that embarrassment of space, why oh why do people think that the place to have a chat is while standing three abreast at the end of the lane that people are trying to turn around at? They must be the same people that decide the middle of the sidewalk is simply THE BEST place to stop and catch up with someone they’ve bumped into, whilst holding about 12 enormous shopping bags. We have a lady who never stops despite being slower than the other people in the lane. She never waits to let faster people past. Or maybe he already has, and the old guy produced pincers and attacked. Who knows? We have one man who does a swim stroke I call the worlds fastest octopus. I swear in those moments he somehow has supranumery limbs. He also looks like Keith Lemon and his speedos are shiny blue. That makes it funnier. Keith Lemon in shiny speedos. I quit, you win. Tip for the hair situation: I wet my hair in the lockerroom and then put conditioner in it, pull it back, and put my cap on. It helps protect my hair from the chlorine AND seems to make it extra soft. Just don’t take your cap off in the pool! The conditioner also seems to wear out my cheap latex swim caps a little faster, but it’s worth it. I’ve seen the kind of foam between-the-leg things for pull drills, and also foam kick boards, but no flippers. I used to love flippers, and those flat plastic paddles for your hands – it felt like you were going at warp speed! *sigh* The length of my local pool. On the one hand, I’m getting really good at flip turns. On the other hand, I have to flip turn every 18 metres. Happily, though, it’s never crowded, so I almost always have a lane to myself, or only share with a sweet older man who is doing weights in the shallow end and moves the hell out of my way. 18 metres?!? What kind of a sick joke is that?? 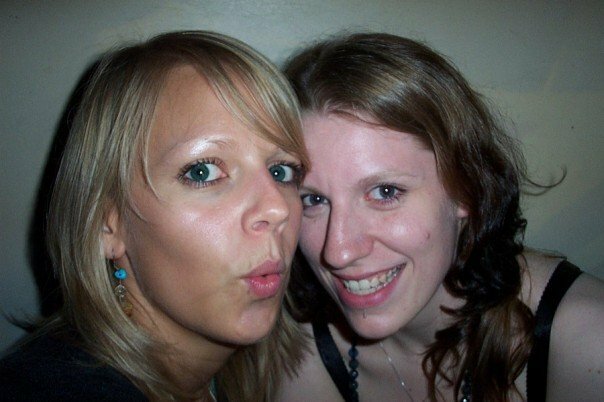 The answer to that hair problem – I am a blonde. Blonde plus swimming is not fun. I slather my hair in this stuff, stick my cap on and then use the same line in shampoo once I am out the pool and my hair is still silky soft and lovely. Even the hairdresser said she was impressed at the condition of my hair given my swimming habits! Thanks for the tip. Seeing as the doc told me yesterday that this is going to be a much longer hiatus from running than I had hoped, I’ll be sampling the masque. Haha! I’d only ever get in a pool these days if there was NO ONE else in there. Sad.